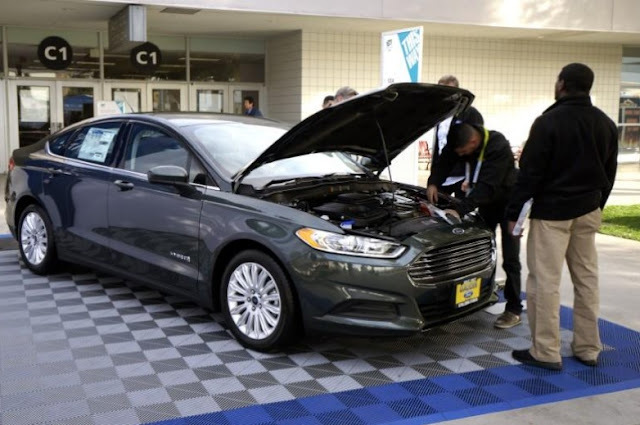 FILE PHOTO: Workers prepare a 2015 Ford Fusion hybrid car for display at the International Consumer Electronics show (CES) in Las Vegas, Nevada, January 5, 2015. The show officially opens on January 6. The U.S. National Highway Traffic Safety Administration said Friday it is opening a preliminary investigation into 841,000 Ford Motor Co cars over concerns steering wheels could detach while driving. The auto safety agency said it is investigating 2014-2016 model Ford Fusion cars after three reports of steering wheel bolts becoming loose, including one report of a steering wheel completely detaching while a driver attempted to turn into a gas station. Ford did not immediately respond to a request for comment. The U.S. National Highway Traffic Safety Administration said Friday it is opening a preliminary investigation into 841,000 Ford Motor Co cars over concerns steering wheels could detach while driving. The auto safety agency said it is investigating 2014-2016 model Ford Fusion cars after three reports of steering wheel bolts becoming loose, including one report of a steering wheel completely detaching while a driver attempted to turn into a gas station. Ford did not immediately respond to a request for comment.